Hang on to your wooden spoon Miss Heather, over at 3 Kids and A Lot of Pigs, I am fixin' to cook without a recipe, AND there are NO MEASUREMENTS!!! ACK! She's been talking about how it takes her out of her comfort zone to cook without precise measurements, but I'm not sure how to even start being precise with the sausage gravy part. It was one of "THOSE" days at the Wallpe farm last week. Something broke, and in the hustle and bustle of trying to fix it, a few other things went south, and well.... I just mosied on back to the house where I felt safe and tried to think of something to fix that might put a smile back on everyone's face for at least a little while. Jent, over at From My Front Porch, had been wanting some homemade fried chicken with gravy and all the fixing's, and that got me on the right trail. 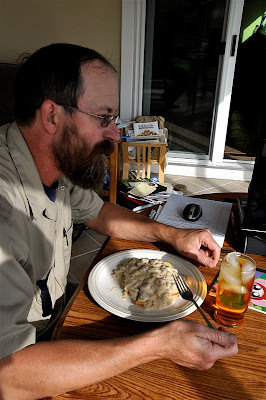 Since it was chilly, and I had a package of sausage out, and I found this great recipe for 7-Up Biscuits from It's a Small Town Life that I really wanted to try, I went for it! *I am going to post about how I made the biscuits tomorrow for Made from Scratch Tuesday, but if you can't wait you can click on the link for the recipe! 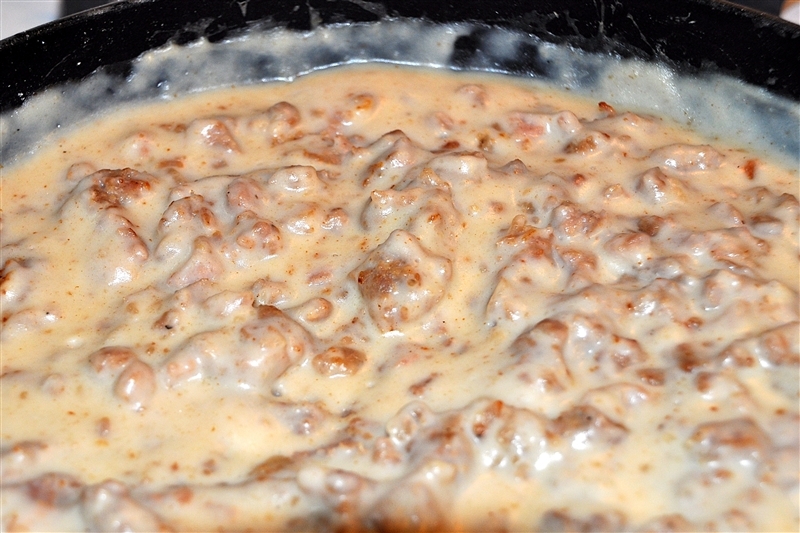 Let's get the sausage gravy started first. Heather, this really is simple, so hang in here with me. 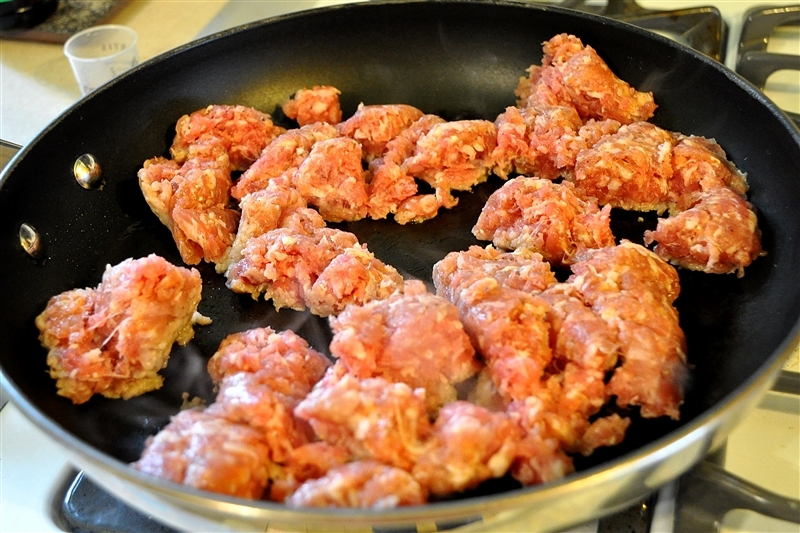 Put however much sausage you want to cook in the pan and fry it up, trying to crumble it as it cooks. I believe I had about a pound of meat. DO NOT drain the grease unless it's all just swimming. You have to have some of the good stuff in the pan at the end. NOTE: I didn't add any seasonings or salt or anything to my sausage. It's all a matter of taste and how your sausage was prepared before it was packaged. I figure it's easier to add salt at the table rather than try to take it out once it's in. And NO! Tussin is NOT a secret ingredient in this meal. Tink had been fighting a cold, so that is why the Tussin bottle is in the background of at least one picture. 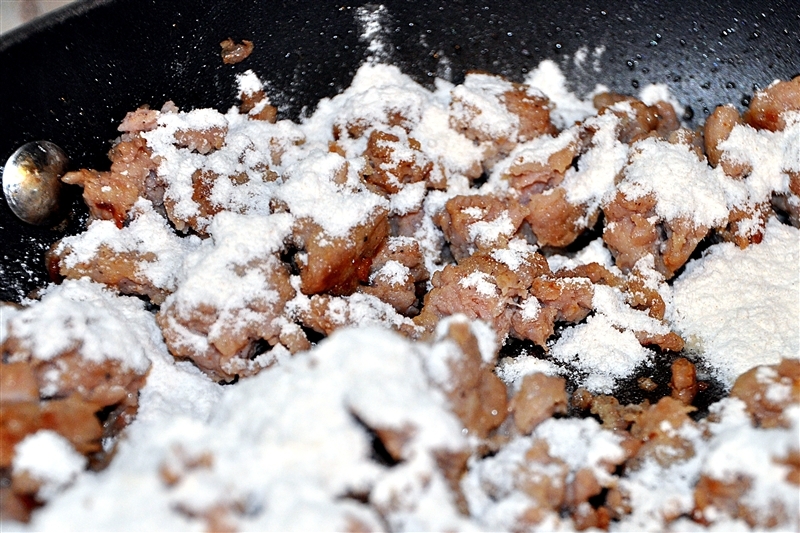 Once it's cooked and crumbled to your satisfaction, turn off the heat, go grab your flour can, and sprinkle flour over until it looks like that first good dusting of snow. Now take your wooden spoon or spatula, and stir the sausage until the flour appears to be gone. 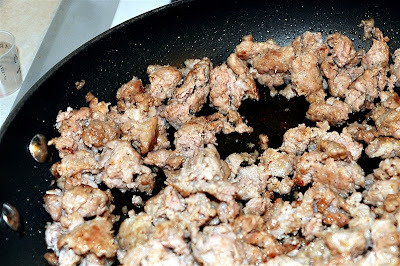 It has soaked up into the sausage crumbles thanks to that grease. You can add a bit more flour if you think the sausage is still looking uncovered. Time to grab your milk and turn the heat back on. 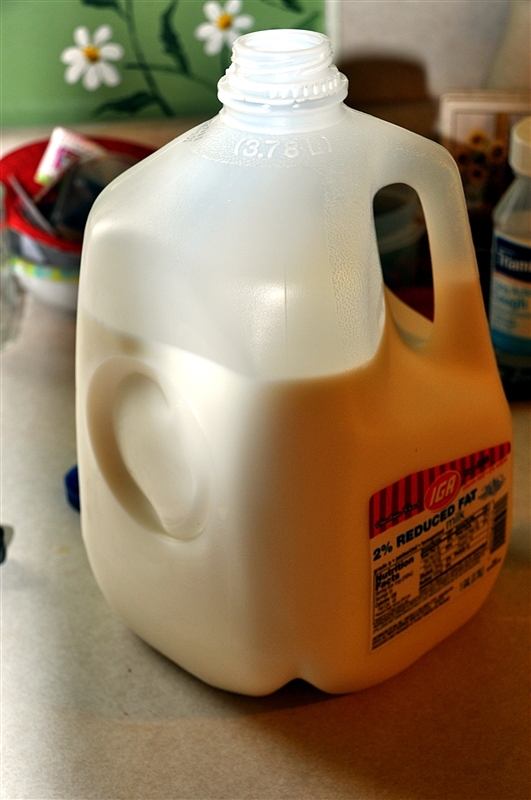 I started with a full gallon, and I used 2% because that's what we drink. 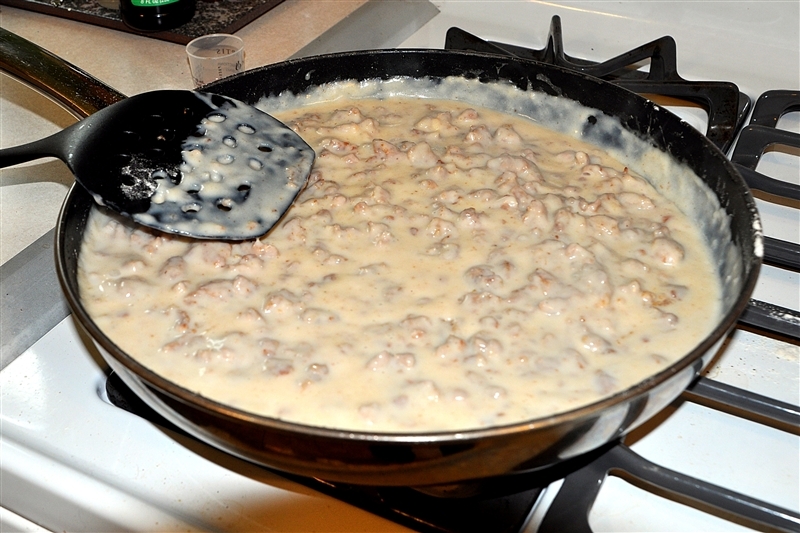 Pour milk into the pan so that the bottom is just covered, and start stirring. The heat and flour will make your milk thicken, so be prepared to keep adding milk, a bit at a time until your gravy is as thick as you want it. 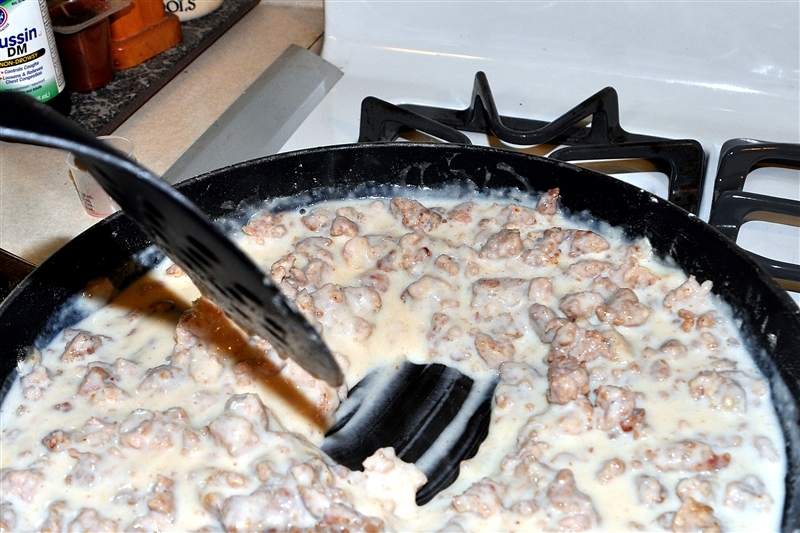 Thick means you can pull your spatula down the pan and see the bottom of it for a while after you are done pulling. This is how much milk I used, if it helps you who like to have some idea to measure by. I actually had to use more because once this was ready, of course the guys were NOT ready to come in, so when I warmed it up, I added a bit more milk because as the gravy cools, it thickens even more. I'm telling you ladies, even the grumpiest guy will have to smile when he sees this on the stove and knows it's going on his plate on top of crumbly biscuits! Remember to check back in tomorrow for the 7-Up Biscuit recipe. That was my moment when things didn't go as I thought they were going to go.....tune in tomorrow for the rest of the story! Just know it has a happy ending! Happy Monday. Head over to Miss Leah's page at Beyer Beware for more great recipes on Hunk of Meat Monday! Just saying Hunk of Meat Monday makes me smile. I LOVE sausage biscuits and gravy but sadly haven't had it for YEARS. So your post has me really wanting some. This dish is one of my favorite comfort foods. Glad to read that Leontien is home. I LOVE sausage gravy and biscuits!!! 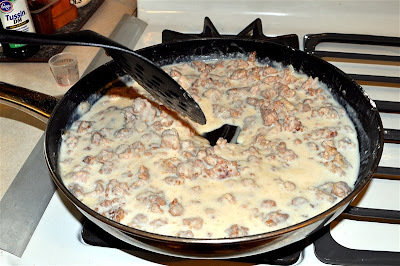 I've always taken the sausage out of the pan and then made a roux with the flour. Next time I'll try it this way. It's easier. 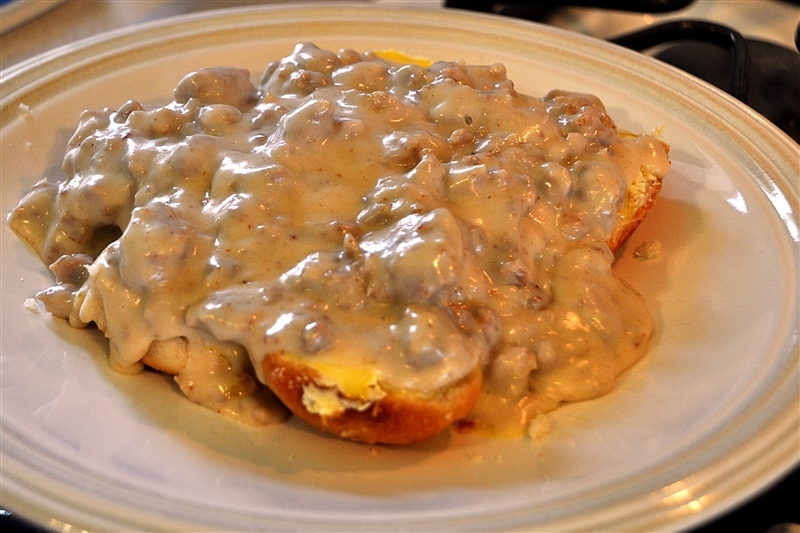 We totally don't have a recipe for sausage gravy either. My husband, who never cooks, has even mastered the little of that and little of this concept to sausage gravy. Love it. Boo's favorite meal of all time! Thanks for linking up to Hunk of Meat Monday too! Now this has me hungry this morning! 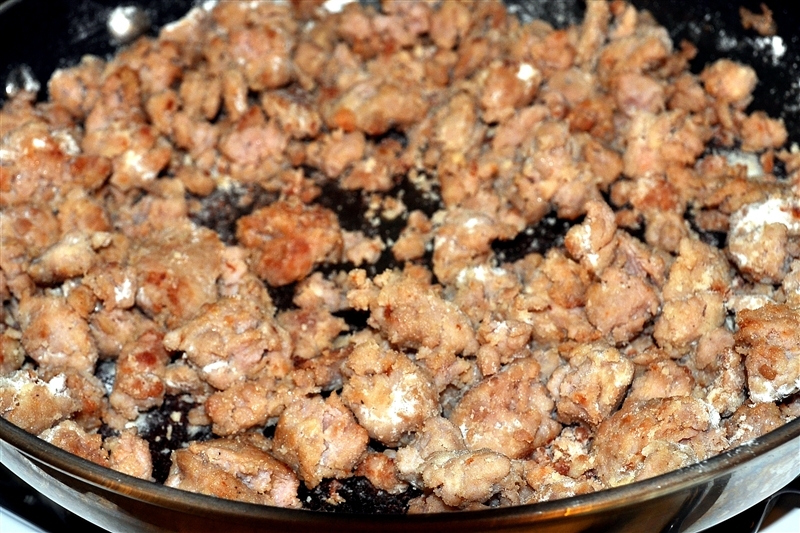 I will have some fresh pork sausage soon and will be making this. I have a grumpy morning teenager that will LOVE it. Awesome! And no measuring is the best Lana.